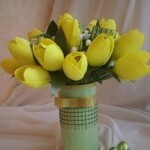 Nice gifts for mothers: bouquets of artificial flowers. Prepare the pot and cut the foam the right size to insert into the pot. Use superglue to glue the foam to the bottom of the pot. 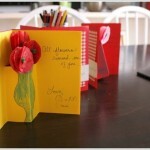 Prepare a thick colored cardboard and cut out its flowers. Using the hole puncher, make hole in the center of each flower, so that it was able to climb the eraser on the end of a pencil. Try not to make too big holes. * Instead of a hole puncher you can use a utility knife or regular scissors. 5. 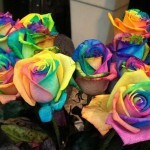 Insert each pencil in flower. 6. Insert the pencil into the foam. * You can use artificial grass or simply wool to decorate the foam on top. * You can tie pencils with bright, wide ribbon. This bouquet will never wilt, and pencils can be removed and used for other purposes, so these gifts for mothers are not only very beautiful, but also very useful. 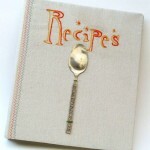 How to wish happy mother day: make Recipe book with the original cover. 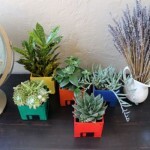 Looking for fresh mothers day ideas: try these Flower pots of old floppy disks.